Reach your team using one button push-to-talk communications that are reliable, instant and secure. When leaving a voice-mail just won't do, push-to-talk communications offer instant, secure connectivity to individuals or teams. 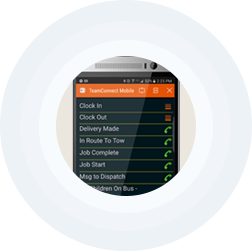 Managers stay updated using smart devices while at home, office or on the go. Drivers use hands-free radios, reducing risks for passengers and business owners. Push-to talk service communications offer instant, secure connectivity with the press of a button. Managers can communicate using smart devices while at home, office, or on the go. Connect with your drivers while they are using radios on our wide-area network, group communication system. Reduce risk and choose push-to-talk radios for hands-free communication in vehicle. Or, use our GPS Lockbox to hold your smart tablets and utilize push-to-talk voice communication. Fewer distractions benefit drivers, passengers, and business owners. Make a discreet private call, send a text or voice alert, or simply connect with your entire team. Know when messages are delivered and viewed with the push-to-talk app. Send reliable, secure, critical updates in an urgent situation. Have peace of mind that you and your team can communicate during the most unforeseen circumstances. Drivers, dispatchers, managers and administrators can communicate using radios, smartphones, tablets, and personal computers. 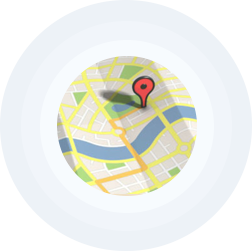 Work team coordinators can speak directly from a map using just their web browser. The reliability of TeamConnectSM eases the uncertainty of not being able to reach your employees when you need them. You don't need to be at the office in order to communicate or connect with your workers. With TeamConnect - you can speak with your entire team from the comfort of your home or anywhere you choose!